With the blade made of stainless steel our Navajas steak knives ensure an effortless, smooth and fine cut. Find out more on Supreminox.com. These Navajas steak knives bring an elegant and contemporary style to your tableware. Stainless steel blade guarantee durability, flexibility and resistance. A black triple-rivet handle provide a safe and comfortable manipulation. Thanks to its ergonomic, curvilinear shape it fits perfectly in a hand, assuring a natural and firm grip. A metal finger protection block provides a perfect balance designed with exact weight ratio. Available in packs of 10 x 6 units (60 units). 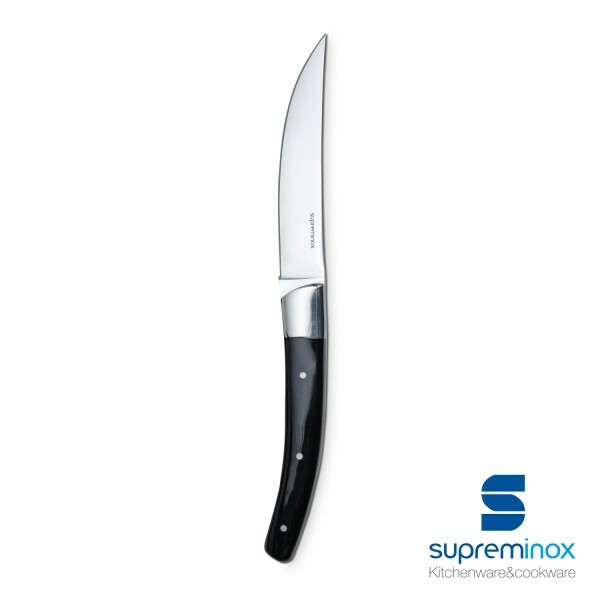 Discover more from our Navajas steak knives collection on Supreminox.com. Click here to order online.